qpsnr stands for Quick PSNR (PSNR definition and SSIM definition). Recompiled main 64 bit package with Ubuntu 14.04, now using libavformat54. Fixed one bug related to image saving; version updated to 0.2.1. Apparently Ubuntu people won't release updated libav* libraries until 10.10. This is a bit sad. Nevertheless, I've released them as well latest binaries. Just scroll below at known issues. Finally got confirmed that libav*.so. * in Ubuntu 9.10 (and apparently even 10.04) are broken (ie. don't support finalized Theora format). I wanted to compute PSNR of some movies, to perform test analysis on codecs; unluckily on Linux I could not find any native tool (eg. tools usable without emulation/wine). One way to compute PSNR is to use mplayer, extract all the frames you're interested into a temporary directory, then invoke some other processes to perform it and finally write it on a file. This approach has many issues. The most important are that is slow, it requires a lot of disk space and involves fiddling around. This is not good. Another issue is that usually PSNR is computed between two sources, a reference and a derivative of the reference (usually the derivative is lossy compressed). 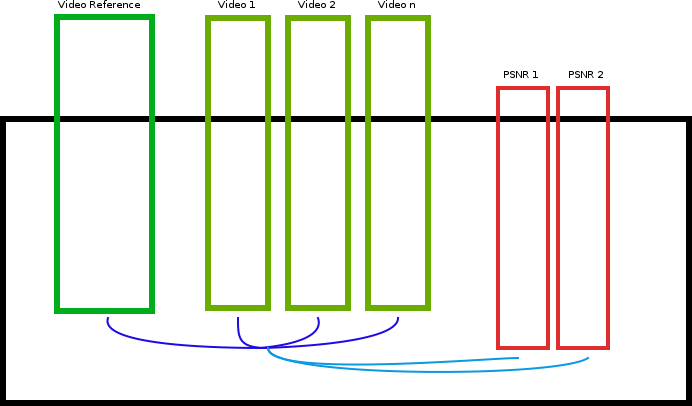 Problem is that I would like to perform the PSNR of a reference video vs. multiple derivatives (like the derivatives compressed with same codec but different bitrate/settings) and the mplayer script approach doesn't really make it. Then I decided to write (in C++ naturally) my own tool, relying on libavcodec to get the frames of video streams; once I wrote the base classes to handle video frames, I then moved on the next big thing to do: make it extremely quick! Luckily I reused previously written threading (threads and thread pools) and synchronization (semaphores) classes. As seen as those had been already tested it has been very straightforward to implement few bits and put the togheter. While analyzer threads do process the buffers, Video threads execute step 1. When analyzer threads are done, go to step 2. This way we don't use any tmpfile and we try to use each available core. Other cool features are that you can get an average of the PSNR (for example each 25 frames) and you can compute the PSNR of other colorspaces, not only RGB. To see all options just run it with -h (or --help) option. will compute the PSNR in YCbCr colorspace skipping the first 2000 frames, saving each frame as ppm image (careful, this will use a lot of disk space!). To compile the sources install libavcodec-dev, libavformat-dev and libswscale-dev. QPSNR It is released under the Gpl V3. If you have any issue with this process, please do report them to me. Please report any bug/issue to me! No issues as of now. The current version of libavcodec installed in Ubuntu 9.10 is not able to properly decode Theora video streams! Ubuntu bug has already been reaised (a forum thread here). To fix this one has to use a more recent (ie. working) version of these libraries. Apparently this won't be fixed in Ubuntu 9.10/10.04 as well, so I've compiled for both i386 and x86-64 the latest version of ffmpeg libraries (those fully support Theora video streams). I'd recommend not to install those in system directories (mplayer for example doesn't really like them), but simply decompress in the same directory where you will run your software and then do the following: export LD_LIBRARY_PATH=`pwd`:$LD_LIBRARY_PATH so when you'll execute qpsnr from there you'll load the right libraries. Please bear in mind that other apps could not work, but in this case, just close and reopen a terminal; with this method nothing will be compromised. While the PSNR is computed on the whole image for each color channel, the SSIM is computed only for Y (as in TCbCr colorspace), only on macroblocks of the specified size; if for example you specify 8x8 size, the SSIM between 2 frames will be computed on 8x8 tiled blocks of the image then an average of each block's SSIM will be taken as final value. Another example, with 640x480 image size and 16x16 SSIM macroblock size, we'll have 40 (640/16) * 30 (480/16) = 1200 macroblocks: the reported SSIM will be the average of the single value of each SSIM. In case you want to tell me anything feel free to contct me at ema at fastwebnet dot it .